‘April come she will….’ go the words of Simon and Garfunkel’s lovely song. For me and my blog/s, April now means Blogging From A to Z . This year, however, I think I’ve overstretched (did I hear someone ask, “What else is new?” ). Okay, so I’m blogging from A to Z through April here and From 7Eight, managing a Facebook Group we created for this purpose and being one of Arlee’s Ambassadors for the event. Additionally, I’m keeping Write Tribe going with the usual writoning prompts and features! So here I am stretching and overstretching to break the rules! Team Damyanti, part of the organizing group for the A to Z challenge, came up with a superb idea. 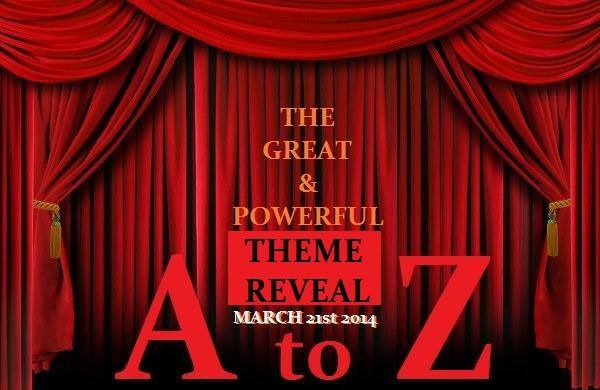 To encourage bloggers to have a theme for the challenge, they’ve organized the Great and Powerful Theme Reveal today. You’ll find the link on Vidya’s blog – do visit to see all the wonderful ideas people have come up with. This is the time that I finally reveal my theme. So if you heard the sound of several drumrolls around the blogging world today you’ll know who is responsible for this – yes it’s us! If you’re a blogger, and if you haven’t already, do join the band! whoa corrnie u are so busy yet rocking.so looking forward to connect with you. Love it, Corinne! Our themes go somewhat hand in hand, you know… No one like dogs to teach us how to Keep It Simple (though I’m not sure about their ideas on holistic lifestyles 😉 ). I’ll be a frequent visitor! Thanks for stopping by Life In Dogs earlier, and sorry it took me this long to return the visit. The Theme Reveal turned out Greater and way more Powerful than expected–all due to wonderful bloggers like you and your team 🙂 Thanks for joining the party! I have always loved the spiritual posts on this blog. Looking forward to more of them. I’m sure you will do great justice to your theme Corinne! 😉 Looking forward to your journey…and can I just say I’m in awe at how much you are doing! I admire your ambition. Too many other “irons in the fire” for me so I shall not participate, but will stop by to see what you are up to on your blog in April. I scramble to get 4 posts out a month now. Doing too much research on subjects and studying now. Also the usual domestic stuff, including yard work. Good luck on your challenge. Thanks, Mary. Oh I completely understand about you not participating! Good luck with your research and study. Life itself is a vast topic, you have relationships, books and spirituality there as well. Wonderful choices, best of luck for the challenge. Thanks, Sulekha! So glad we’re doing this together this year! i love reading about all those things! i love an ecclectic theme! i look forward to april! and i’m a sub-ambassador for arlee… he adopted us for the challenge, since Jeremy is recovering from a serious injury. Thanks for stopping by, Tara. I’m glad we’ll be connected via the challenge. Give me a shout if you need an assist with anything. What a wonderful theme you have here Corinne! Really looking forward to all the dancing on this blog, and learn some steps too along the way 🙂 And you are going to do all that in addition to the dancing! Amazing indeed. All the best. And great cartoon, by the way! I’m flabbergasted!! I’m all proud and stuff that I’m able to manage one blog. You astound me, Corinne!!! I’m looking forward to your April posts. Look forward to your wisdom filled posts. Keeping one’s options open is a smart way to go. Thanks, Suzy. I’m looking forward to yours too. A simple, but beautiful theme, Corinne 🙂 Waiting for the month to unfold 🙂 🙂 🙂 This is going to be inspirational ! Thanks, Sreeja. Off to look at what your theme is going to be. When your blog has such a lovely theme, it make sense to stick to the same theme for April A-Z. Looking forward to your April A-Z posts! So nice to connect with you and all the best the challenge! Sounds like fun. I’ll be sure to stop by and learn all about the keeping it simple, authentic and holistic. See you in April. Thanks, Silvia! Yes, see you in April. Good luck with the challenge. I have no clue how you do all of that while offering to lend a hand to whoever needs help. Best of luck with the challenge, I’ll be around for sure. I really don’t have much else to do, Tulika! 😉 Good luck with the challenge! Sometimes, simplicity is the only way to go! Your theme works perfectly for the Challenge. I love the simplicity and natural flow of your posts … I am sure April Gyaan will be full of take aways for all of us…All the best superwoman!!! I was a fly on the wall at your session, Shilpa! 😉 And yes, April is going to be fun, alright! Awesome! Will be looking forward! Thanks, Danny. Looking forward to knowing what your theme is too. Thanks for stopping by – I just read your post too and your idea is fascinating! Good luck with the challenge! Thanks, Naba. I hope they’ll pass! We used our taglines as themes. Hugs! And let’s have fun! I promise I didn’t copy! And fun? Of course, we’ll have loads! Great idea, Corinne. 🙂 Don’t know where you find the time and energy to do all that. I am in awe! Looking forward to your posts. Have a good weekend. I’ll be looking forward to reading about your travels.